The Guardian published a story on April 21 by Phoebe Greenwood entitled ‘First Bethlehem marathon staged in howling wind and rain‘, which focused on the putative challenges faced by Palestinians in organizing their first-ever full marathon. A Palestinian city encircled by Israeli settlements, bypass roads connecting the settlements and checkpoints, Bethlehem cannot offer an uninterrupted 42.2km full marathon course. 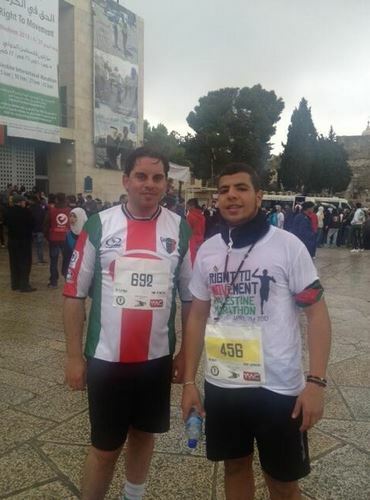 The 26 competitors who ran the full race were required to make two circuits of the city along a course that passed through two refugee camps, alongside the Israeli separation wall, turned back on itself at a checkpoint and finished back at the Church of the Nativity. “In any other country, a marathon runs from point A to point B. In the West Bank, we have to run from point A to point A. It’s around 40km from Bethlehem to Hebron but runners would have to cross the Israeli settler roads, and that could never happen,” said Xavier Abu Eid, a Palestinian government spokesperson and native Bethlehemite. Xavier Abu Eid is, according to his short bio at ‘This Week in Palestine’, a “Palestinian-Chilean student of political science and Vice President of the General Union of Palestine Students in Chile”. He’s also a marathon participant. Greenwood naturally lets Abu Eid’s claim about the ‘atypically circuitous route’ of the marathon go unchallenged. However, a quick glance at the Palestinian Marathon route in contrast with Israel’s annual Jerusalem Marathon undermines Abu Eid’s suggestion. 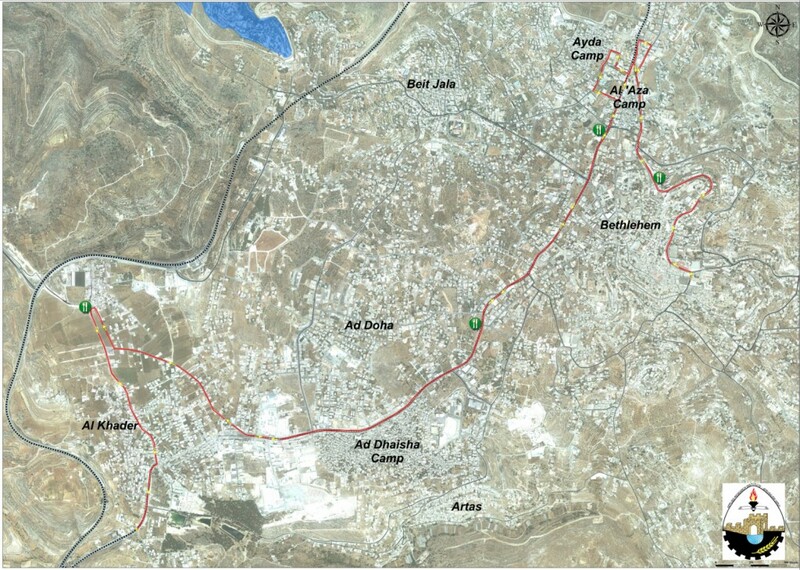 As you can see, the route begins near the Church of the Nativity in Bethlehem, then travels north before heading southwest towards Al Khader – where runners then turn around and run back towards the Bethlehem starting line. 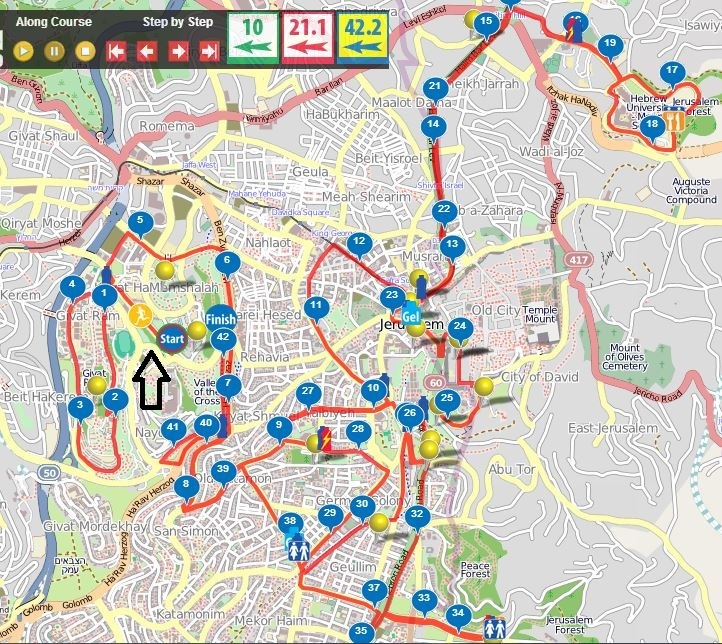 Participants who did the half marathon ran one (roughly 21 km) Bethlehem-to-Al Khader loop, while those running the full marathon (42.2 k) ran two such loops. As you can see (by following the race which begins by the black arrow), the 42K run begins by circling Givat Ram before, in a far less than direct route, heading towards Hebrew University’s Mt. Scopus Campus, where the runner doubles back (along some of the same route) to the finish line, which is positioned roughly 500 meters across from the original starting line. Additionally, the Tel Aviv Marathon doesn’t employ a direct route from “point A to point B” – but similarly requires that runners turn back at a certain point, and run a second time along part of the same route to reach the finish line. Of course, it was just one throwaway line by the Palestinian spokesperson – but its significance transcends the minutiae of the specific claim. In late 2011 we posted about a Tweet by Greenwood indicating her skepticism over a comment by then Israeli Vice Prime Minister (now Defense Minister) Moshe Ya’alon about incitement, racism and the glorification of terrorism in Palestinian school textbooks. As we noted at the time, evidence regarding such hate education by the Palestinian Authority is extremely well-documented by sites such as Palestinian Media Watch, and its difficult to understand how a professional reporter could seriously question the veracity of such reports. For those who carefully follow the coverage of the Israeli-Palestinian conflict, it’s very difficult not to observe the credulity of reporters at the Guardian and elsewhere in the face of even the most flippant and often unserious Palestinian statements, in contrast with their extreme skepticism when they cite even the most intuitive and empirically based Israeli claims. For those who carefully follow CIF Watch, it’s very difficult not to observe the credulity of Mr. Adam Levick when he believes himself to be a journalist. Therein lies the beauty of blogging and other forms of citizen journalism. Folks just require some knowledge about the Mid-East, the ability to do some internet based open source research, and the willingness to think critically in order to hold “real journalists” responsible for their lies and distortions. Adam’s reply to ‘Credulity’ is the most concise and telling response to something asinine I think I have read on CiFwatch. Seconded (well, actually thirded given Moshe’s response). Are you “sanity” by any chance? So, “sanity”, aka the Knight of Hypocrishire, is not only the contumacious moron we all know, but he’s also a coward sock-puppeteer of the same type as “nat”. Credulity. We can see that you have much more in common with the Guardian and the middle class lies it continually tells about the Jewish people. You are quite welcome to f**k off in that direction, but being first off the starting block with your bigoted responses over here shows that you suffer from the 2000 year-old European affliction of the ignorant and malicious: The ‘obsessed by the perfidy of Jews’ syndrome. … the 2000 year-old European affliction of the ignorant and malicious: The ‘obsessed by the perfidy of Jews’ syndrome. Steady on, mate. We’re not all bad guys, y’know! I know Pretzel. It’s a certain mindset that doesn’t afflict everyone. But still – bizarrely – all too many. On that we can sadly agree. I’m pleased to say I don’t know Nat. And I’m Ariadne but WordPress can’t get it right all the time. Erm … I think the marathon here in Berlin, at least, starts and finishes at the same place (the Brandenburg Gate). Exactly. Was I wrong to point out the folly of the man quoted? And what about the Kinneret Marathon? And the Manitoba Marathon? I’m confused. Did I say something offensive? Au contraire, I’m supporting (and expanding upon) your point. Silly me! It was the disagrees above that had me puzzled. I am at a loss to understand what makes intelligent educated people devote their lives to Jew hatred. Harriet dear must of course be acquainted with the chief hate propagandist, Ben White. It must be excruciating to have to think up all those faux anomalies to back their case of the day. I think its time to pity these poor sods living as they do totally twisted in hate whilst Israelis are proven to be amongst the happiest people in the world. And before they chuck that back at the Jews, let them be reminded that Israel is comprised if Jews, Christians, Muslims and other groups such as secularists and B’Hai. Lets form a “pity the Jew haters” forum. They’re such sados! That still doesn’t make one understand how an educated person could hate so much so as to defile their own being. That’s what Jew haters do to themselves. As for we Jews “We will survive” as we always have done despite people like you, to be as always amongst the happiest peoples on earth. Sherwood a Jew hater?? Try to widen your horizons. A partial answer would be that their usual tendency toward racism has been stifled by political correctness and Jews/Israel is now the last “legal” form of xenophobia permitted them. 1. The point being made about freedom of movement. 2. The conditions under which the Israeli gov’t decided to employ those restrictions. 3. The nature of the bureaucratic and militarized zoning of the West Bank. 4. The impact that this has had on negotiations. 5. The ways in which this has assisted settlement building. 6. The political divide that this has caused within Israeli society as well. So agreed, the article did not tackle these issues from the best angle, but I think that media watch approaches like this don’t do as well to serve information or knowledge on the Middle East either, as it speaks to the slant of various outlets…and that’s also giving a nod to those outlets that are unquestionable pro-Israeli, but it doesn’t really address these issues in a much more direct or concise manner. @Roxanne – Freedom of movement for terrorists is unacceptable to Israel. The West Bank is disputed territory, like it or not. It’s high time you and the Guardian acknowledged that. Opposition to occupation, opposition to ethnic cleansing, opposition to racism cannot be equated to being anti-Jewish and to suggest that as this blog does is racist in the extreme. It is not the Jewish people who occupy. It is the Zionist regime in Israel that is the occupier. It is the Zionist regime in Israel that exercises Apartheid and it is the Zionist regime that is guilty of ethnic cleansing. All just minded people, including Jews, Muslims, Christians, peoples of other faithf and those of no faith are against Apartheid, racism and occupations. Of course you are right in principle, but this only applies to Israel if there is an “occupation”, which there categorically is not. This propaganda is no different to that used by Hitler – defame the Jews in whatever way possible. If you don’t believe me look up the original PLO charter that speaks of reinventing the Arabs of the British Mandate as “Palestinians” as the ultimate weapon against the Jews of Israel. In this they have been totally successful as people now believe this replacement theology of Din Al Fitra usingTaqqiya to confuse people like Sherwood. That’s what the pity is for her and her ilk as they have no roots in their own Christian background and therefore none in ancient history. This is that problem western secularism has and continues to cause those of us who truly believe in freedom of the individual as apposed to being duped by a 6th century retrograde ideology passing itself off as a religion of peace. Not to mention what Israel has given to the Palestinians with very little non-annihilatory in return. It’s not the Zionist “regime” (regime? you ARE hysterical!) seeking ethnic cleansing, but the racist Palestinian regime, the racist regimes of Hezbollah, Hamas, the Muslim Brotherhood, and most, if not all of the Arab regimes on planet earth. You’re understanding of what constitutes racism is McCarthyite, (and I’m being kind). The so-called occupation, or whats left of it after the failed Oslo experiment is still fully justified under the circumstances. Only when the Arabs give up their ultra religious/nationalist/ racist war against the independent Jewish National Home will there be peace. Until then, cry me a river, racist. Sharon obviously you did not read what I said – Once again, just as fascism does not equate to Germans, Zionism does not equate to Jews. As for your ‘invention of the Arabs as Palestinians’ bears a very close resemblance to the invention of the Europeans as French. Get a grip. just as fascism does not equate to Germans, Zionism does not equate to Jews. Oh, please. Is there really no other comparison in human history that you could come up with? Get lost, moronic sock puppet. ashley george equates to fanaticism in the same way the German state equated to fascism between 1933 and 1945. I want to run the Dead Sea half marathon one year. Though I’m not sure a post-run dip would be wise, given the sores and nips that can open up during a long run! The Dead Sea – keeping the aquatically challenged (like yours truly) buoyant for millennia! pretzelberg Zionism and Fascism are two ideologies I know that are based on rights according to ones race – if you can give me another ideology where rights are based on race I will quite happily use it to compare it with Zionism. I just cannot think of another racist ideology that is racist like Zionist ideology. Far from being a cause of the revolution, antagonism to Israel everywhere served the interests of oppressors. Europeans have no right to be surprised. Of all people, we ought to know from our experience of Nazism that antisemitism is a conspiracy theory about power, rather than a standard racist hatred of poor immigrants. Fascistic regimes reached for it when they sought to deny their own people liberty. . . . There must be a percentage of the “anti-Israel” propagandists who are just too stupid and/or lazy to do the necessary work. Truth certainly doesn’t grow on the Guardian tree. Good for you. You are such a clever boy! You can carry on with your delusion that hating Jews and their national project is progressive and anti-racist. You ain’t no different from all the other European anti-Semites though, except, perhaps, you are a bigger hypocrite than the more traditional types. But a real chip off the old bigoted European block, none the less. BTW, thinking of cultures and ideologies that have spawned racism and hatred of the Jewish people, I can cannot think of another more murderous ideology than that of European Christianity, European Nationalism, European Communism. All in the name of humanity and progress. Where do you fit in with all that AG? Do tell us about your racist ancestors and the crimes they have committed against the Jewish people and then perhaps we will be able to see the genesis of your arrogance and bigotry. I’ll say it again…you are groovy. You are completely confused, and the intent of your remark is slanderous. Until you educate yourself as to the true meaning of words, instead of likening things according to your prejudices, you’re not even worth talking to. As pointed out in a recent BBC special report, Zionism was born as a “liberation movement like any other”, with the aim of relieving a persecuted people. If you want to call that “racist”, then you might as well apply that term to all the liberation movements in history – and there have been a few. Incorrect again Ashley George. It’s based on nationality. No, Truth is artificially manufactured by racists and fascists who claim monopoly on everything for their race. They are not occupiers because it always belonged to them as the superior race. They are not racists because they are the best and deserve better rights than others. Pity is that in reality there is no such thing as a race except the Human race and that everybody has the right to live in his home irrespective of any perceived race. Spoken like a true conspiracy theory merchant! Natzie fancies that this is truth. A Manichaen view of the world, typical for conspiracy nutters. The only artificially manufactured thing here is YOU, moronic sock-puppet. Get lost. AG, and you of course, claim to have a moral monopoly and where the Jews should or should not exist. So you can add colonial arrogance to your own visceral racism and fascist tendencies. You forgot John Craven and Big Bird.